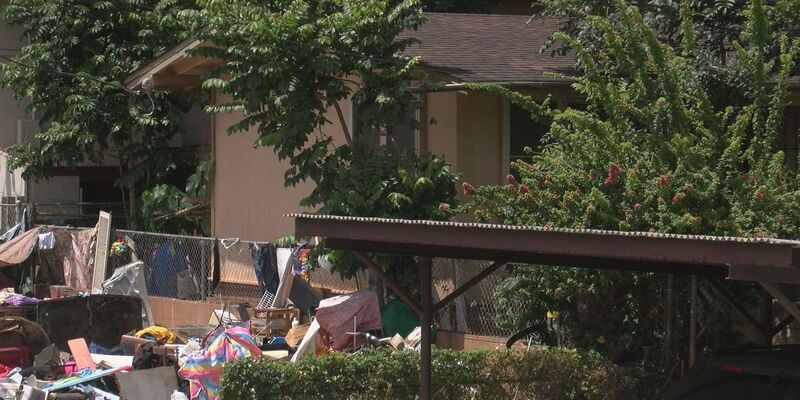 WAHIAWA, OAHU (HawaiiNewsNow) - After years of complaints being ignored, an abandoned Wahiawa home that was overrun with illegal squatters is finally getting cleaned-up. Since 2013, squatters have had free rein over an abandoned Ohai Place home that neighbors nicknamed it the "Ice Palace." Weeks after a Hawaii News Now report on the property exposed what neighbors called a violent drug den, Honolulu police officers finally took action on Monday. "There are new faces there all the time," said a resident who asked not to be identified for fear of their own safety. "It's usually to pick up drugs." Although a large portion of the camp is gone, some neighbors told us they still don't feel safe. When we went to check out the area, we found out why. Some of the alleged trespassers were back, livid that they'd been booted. "F*** you!," someone shouted from the driveway of the abandoned home. "F***ing beat it, before I broke (sic) your camera!" "We've been making contact with them for a few weeks now," said Cora Pierce. "We tried to help them into transitional housing or shelters or whatever we could do for them, and they just didn't want it," she said. Despite police hauling away the vehicles they used for shelter, neighbors say the campers haven't gone far. Some have simply migrated to more private property in the woods just behind the homes. The property is currently in the foreclosure process. The mortgage company says it's working with HPD to eventually secure the home itself.